There are no bears in the Little Bear Bakery. And this is my tale. Surveillance is Muffin's game and the night shift is her domain. When the baker goes to bed, Muffin goes to work. She knows the clangs and crunches of the alley raccoons, the squeak-scratch of the inside-the-wall mice. She thinks she's heard it all, until... there's a mystery growl in the bakery, and she discovers the back window open. I slipped into the darkness like icing melting down a hot cake. And that's when I saw it. It was the biggest mouse I had ever seen. Actually, it's no mouse. It's a very hungry baby bear whose little belly is growling. What's a kind kitty to do but offer some of the bakery's wares? I was on the case! It smelled like a dumpster on a hot day. Muffins tail and eyes get way bigger than usual. But Mama Bear is grateful that her baby is safe and well-fed, and Muffin finds herself engulfed in an overwhelming bear hug as warm as a sun-warmed (but smelly) bath mat. It smelled like the bath mat needed a bath. All's well that ends well, with two well-fed bears beating a satisfied retreat and Muffins, her work here done, calling it a night, curling up for a quiet pre-dawn nap on the baker's bed--until he wakes up to a big surprise, in Julia Sarcone-Roach's There Are No Bears in This Bakery (Alfred A. Knopf, 2019). 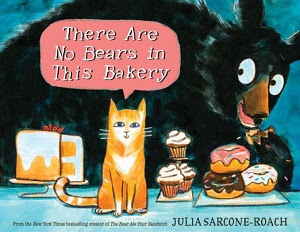 Sarcone-Roach's storytelling is drolly narrated by her clever cat-sleuth Muffins, and her delightfully smudged and watery nighttime palette extend the the text brilliantly with many details to please the eyes of young readers. Says School Library Journal, "The front endpapers feature a scrumptious array of iced buns, cookies, donuts, and eclairs, while the back ones show the remnants of the night's feast—-nothing but crumbs and a half-eaten doughnut near a small gray mouse exclaiming, 'I love sprinkles!'" This one is a kid-pleasing winner!